The words “Michelin-star” and “pub” don’t often get mentioned in the same breath together anywhere in the country, yet alone in London. But it’s official: The Harwood Arms is London’s first ever gastropub to make the cut. And with starters at £6-£7, and mains no more than £17, it’s probably the cheapest Michelin-starred food you can get in the capital. The brainchild of Mike Robinson (of the Pot Kiln in Berkshire) and Brett Graham (of the double-Michelin starred Ledbury), this quiet, corner pub appears no different on the outside to any other Fulham Broadway neighbourhood watering hole. But peer inside into its light, airy Georgian interior and what greets you will be the crackle of their cozy fire-place on a cold winter’s day, the buzz of happy diners sat around rustic wooden tables and some truly awesome pub grub. The duo have managed to take what is best from their wildly varying trades to produce a unique gastropub that marries the best of rural Berkshire’s produce with exemplary execution and flair to deliver dish after dish of mouth-watering combinations. As none of us were starving, we skipped on starters and shared a couple of their much raved about Venison Scotch Eggs from the bar snack menu. 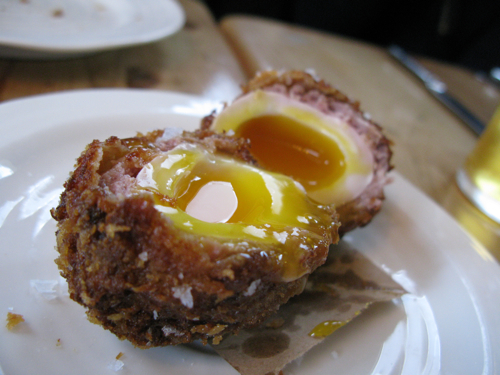 When I think Scotch Eggs, its usually the soggy, greying, school dinner kind sitting rather neglected at the salad bar. These however are clearly from another planet. It’s hard not to drool as you cut through the beautifully crisp bread-crumbs, gamey sausage meat, then finally the still runny egg to reveal the glorious cross-sectional layers of this beast of a Scotch Egg. The gratification of cutting through the egg alone is enough to justify the £3 price tag. Unbelievably good, and I promise you… it tastes better than it looks. I’m told it’s a 2 to 3 week wait for a weekend table these days, but if I’m ever in the area again, I’m going to make sure I stop by for an impromptu pint at the bar and have one of these beauties again. With the salivary glands already in overdrive, we were ready to move on to devour the main courses. Predictably, us boys opted for the most carnivourous choice of the day: Roe Deer steak and Douglas Fir Sausage, which was served with flatbread, grilled field mushrooms and a creamy celeriac slaw on a small wooden paddle board. I don’t know why they don’t just serve this on a larger chopping board which is large enough to eat from without the food falling off the edges. I found the cumbersome activity of transferring my food from the wooden paddle to another plate a real wet blanket on what was otherwise a bloody glorious carnivour’s day out. 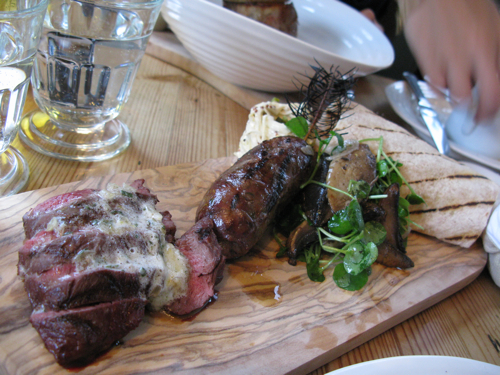 The deer meat was a flavoursome medium-rare… gamey and tender as it should be. What I enjoyed even more though was the Douglas Fir sausage – juicy, meaty and absolutely full-on in intense, smoky flavour. 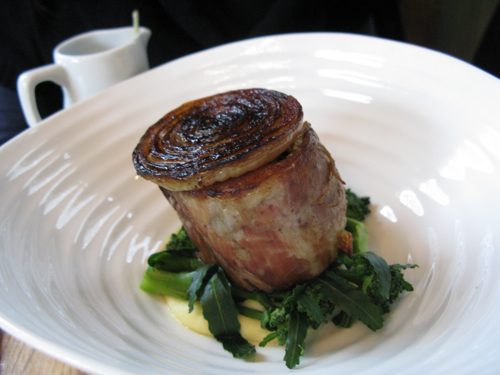 The girls both decided on a more civilised option – Braised Lamb shoulder with Crispy Haggis, Broccoli and Rosemary broth. An elegant and polished dish which was deliberately kept simply and unfussy so as to allow the ingredients to sing for themselves. No complaints from C & M as they cleaned their plates, the shoulder tender enough from slow braising to cut through with a fork. To finish, the selection of desserts here range from Brit classics such as Eton Mess to more creative, cutting-edge puds. I went for one of the latter. Rather disappointingly, my Buttermilk pudding with Poached pears and Perry sorbet wasn’t much of a looker when it arrived. 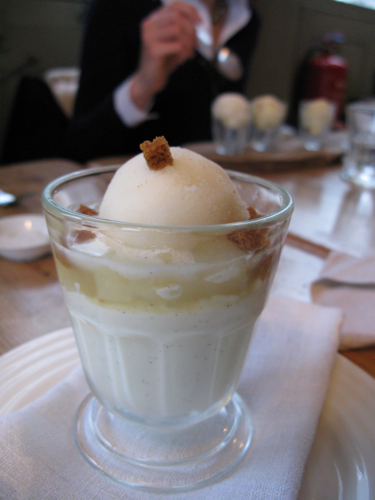 Taste-wise though, the milky-sweet pudding was like a Panna Cotta, only more luscious and vanilla-ey. The acidity from the poached fruit and zingy perry sorbet helped to cut through what would have otherwise been an overly sweet pud on its own. p.s. thx C for organising. Was great catching up! Another interesting article on your blog, keep up good work!